Kelly E. Dwyer is a writer, mother and instructional designer who lives in the Washington, D.C. metro area. Kelly has been writing speculative fiction since 2008. She was first published by Abyss and Apex online magazine in 2010 and has had stories published in print and online with Escape Collective Publishing, Trysts of Fate and the Outliers of Speculative Fiction. Her first published piece of short fiction, “Sunlight,” earned an Honorable Mention in The Year’s Best Science Fiction #28, edited by Gardner Dozois, and was reprinted in The Best of Abyss and Apex, Volume 2. Kelly has participated in programming at Capclave, the Washington Science Fiction Association’s annual science fiction convention, and at World Fantasy Convention. 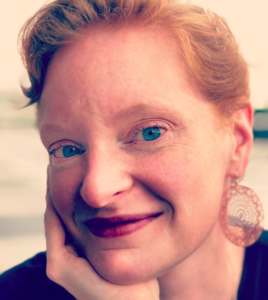 She runs a monthly critique group for female-identifying and non-binary authors, poets and playwrights, and participates in another monthly fiction critique group with members of Maryland’s speculative fiction community. Kelly grew up in Northern Virginia, and graduated from New York University with a Bachelor’s in Dramatic Literature, Theater History and the Cinema. She worked on Wall Street in Global Compliance Training for the Financial Services industry for several years before moving to Minnesota to start a family and complete a Master’s in Education specializing in Instructional Design and Learning Technology. She returned to the DC metro area in 2009 and was a stay-at-home Mom to her two sons before moving to California for several years for her husband’s job. The family moved back to Northern Virginia in 2014 very happily and has no plans to ever move again. In 2018, Kelly was diagnosed with Crohn’s disease after many years of failing health. You can follow her experiences living with a chronic autoimmune disease at www.keepingmyshittogether.com.